Jenkins appears unlikely to play against Missouri. 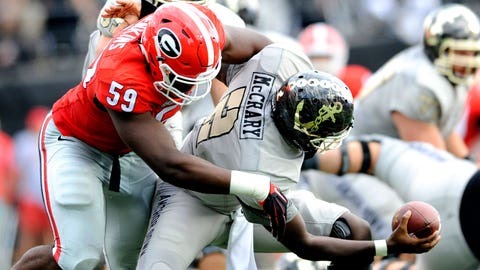 Facing SEC East elimination, Georgia will likely be without a key member of its defense as linebacker Jordan Jenkins’ nagging groin injury is expected to keep him out of action. According to 247Sports, Jenkins aggravated the injury in the Tennessee game and is "likely out" for the Missouri game. Jenkins is believed to have first sustained the injury in the game against South Carolina. Sources indicate Jenkins could return for the Florida game, held in Jacksonville on Oct. 31. Jenkins loss could be a big one for the Dawgs, as his disruptive presence lead him to win SEC Defensive Player of the Week and Chuck Bednarik Award National Player of the Week honors following his Week 2 effort against Vanderbilt. If Georgia fails to beat the Gators on Halloween, they stand no chance of catching them in the SEC East standings this season.